What is an Implant Retained Hybrid dental appliance? 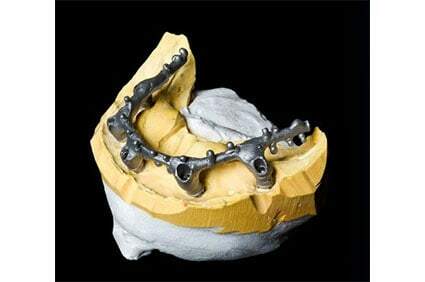 A Hybrid dental appliance is a prosthesis supported by implants. 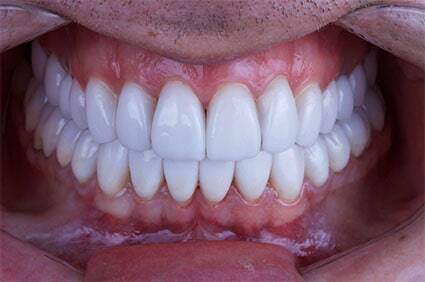 It can be made of all zirconia with porcelain gums and zirconia crowns, (a Prettau bridge). 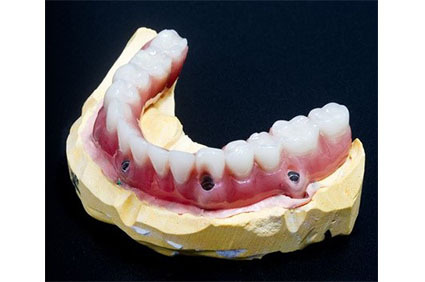 Or it can be made with a metal bar mounted inside an acrylic/resin denture, (a hybrid denture). Both will look very natural, although the zirconia is the most aesthetic. Both are non-removable by the patient, and can only be taken out by a dentist. The hybrid appliance is held in place by screws that fix it in place, over the implants that had been previously inserted into the jawbone. The type of materials used, is determined by the number of implants that can be placed, and the quality of the bone when the implants are put in. The zirconia appliance requires at least 6 – 8 implants, because it is heavier, and will put more stress on the implants. For a full arch of 14 teeth, the acrylic appliance needs 5 implants in place, although with just 4 implants a shorter arch of just 12 teeth may be possible. 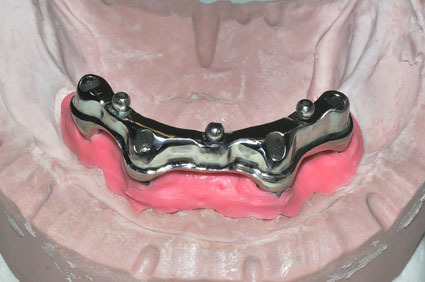 After the implants have integrated into the jawbone, they are connected by abutments, that are part if the appliance. Screws go through the appliance, and framework, into the implants. The holes, where the screws go through the appliance, are filled with a composite resin, that matches the color of the teeth. The appliance does not cover your pallet, but just covers the edge of the gum, and is hardly visible. Hybrid appliances are not so bulky and are much more stable then dentures. Because they are fixed in place, they do not shift or rub the gum, nor make the gum sore. Also, as they do not cover the roof of the mouth, they feel much more natural, and don’t affect the way food tastes. Patients who wear a hybrid appliance often enjoy a wider variety of foods more comfortably. As with any dental replacement, good oral hygiene is crucial to long term success. The hybrid appliance is designed for you to be able to clean easily underneath. Usually the patients use a WaterPik, also there is a special type of floss, for under bridges that will work. However, it is recommended that the patients have a dental cleaning twice a year, where the dentist will remove the appliance to clean under it, and so he can replace components, screws or make adjustments, if indicated.